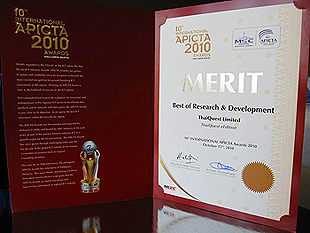 ThaiQuest e-Edition, an innovative software by ThaiQuest, attracted recognition for Thailand’s software development quality as it secured Merit Awards for Best of Research and Development from the 10th International Asia Pacific ICT Alliance Awards 2010 (APICTA2010) held at Kuala Lumpur, Malaysia on October 15 of this year. ThaiQuest e-Edition provides a virtual newspaper reading experience via web browser with quality Zoom-In/Out features that preserve the crystal clear resolution of article text and image display, powerful Full-text search technology in Thai and English languages, Page Flip, Magnifier and more. With quick and easy access anytime and anywhere and an extensive support for upcoming touch-screen devices, ThaiQuest e-Edition is an essential tool for newsprint publishing cost reduction and a newspaper circulation acceleration. “As one of the representatives from Thailand, ThaiQuest is proud to soon promote Thai software quality at an international level, taking this award as our ticket to create the market impression in Asia-Pacific countries. We, hereby, would like to express our sincere gratitude and appreciation to friends and staff behind the success of TICTA and APICTA event organization that have led us to this honor,” he continued. Asia Pacific ICT Alliance (APICTA) Awards is an international Asia-Pacific software competition comprised of 16 member economies that are not merely participants but also permanent supporter for this event. This year, the competition is held at Kuala Lumpur Convention Center, Kuala Lumpur, Malaysia as a special celebration for its 10th anniversary with over 162 nominees from 11 countries in 16 categories during October 12-16, 2010. ThaiQuest Limited is a Thai company with its business focus on software and technology development that is capable of tackling massive amount of data in the shortest time possible. Over the decade, its software specialists carefully conduct numerous research, design and develop a genuinely fast and reliable search engine (ThaiQuest Enterprise Search) that outshines other search engines available in the market as it supports real-time, full-text search in Thai and English, unlimited data storage and sub-second retrieval. ThaiQuest’s software development process has been certified by Capability Maturity Model Integration (CMMI) from Software Engineering Institute (SEI).